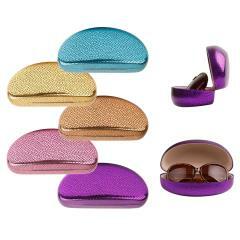 Assorted Package of 12 Sunglasses Cases. Interior Measurements: 6" x 2.5", Fits Most Sizes of Sunglasses, Clear Lenses Glasses, and Prescription Glasses. Good Quality and Made with High Quality Materials. The Package will Include 12 Cases in Same Style. Case Only! Will NOT Include Sunglasses or Cleaning Cloth!